One of the most prominent geographical features of North America, the Great Lakes played a pivotal role in the economic and industrial development of Canada and the United States. While allowing the establishment of a highly efficient transportation system, these freshwater seas have also proven particularly unforgiving when stirred up by the forces of nature. Capable of producing some of the most treacherous conditions faced by mariners anywhere on the globe, the Great Lakes have claimed thousands of vessels since the earliest days of navigation on their waters. Sailing Into Disaster details the stories of ten vessels that met their demise without leaving a single survivor. Ranging from early wooden schooners to steel steamships, the tales included in this volume represent not only the perils faced by these vessels but also their crews prior to the advent of modern navigation equipment. While a few of their number have been uncovered through concerted search efforts, the majority of these lost ships remain elusively hidden in the watery depths of these landlocked oceans. 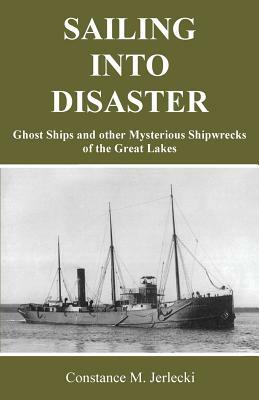 Among others, this book includes the loss of an early Great Lakes schooner on Lake Superior, the mysterious disappearance of a steel steamer that sparked tales of it becoming a wandering ghost ship, the unexplained sinking of two naval trawlers, a small tugboat that sailed into oblivion on Lake Erie, and a self-unloading bulk carrier that remains missing in the depths of Lake Michigan to this very day. A lifelong resident of Michigan, Constance M. Jerlecki has written four books concerning the history of the state she calls home. This is her first book on Great Lakes shipwrecks.